Samsung has been successful with record-breaking smartphones sales and a reported 95% of Android profits, but its chairman still wants to shake up the company's concentration on hardware. To do this, it has to "get rid of business models and strategies from five, 10 years ago and hardware-focused ways," said Lee Kun-hee, according to the Wall Street Journal. His annual speech at the start of the year is the latest indication that Samsung wants to improve its own software and reduce its dependency on Android. Right now, the company has its TouchWiz interface and a number of homegrown apps available on Google-powered devices like the Samsung Galaxy S4 and Galaxy Note 3. Clearly, the chairman wants more. As Android users get accustomed to Samsung's pre-installed software and sign up for its new services, the company's developers continue to work on the Tizen operating system. 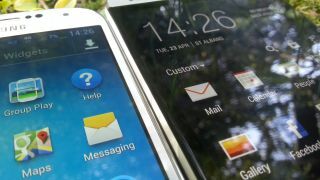 Tizen is Samsung's Linux-based operating system that's being prepped for its smartphone debut later this year. It's already powering one Samsung camera in South Korea. With HTC and LG trying to muscle in on Samsung's Android territory and relative newcomers like Huawei threatening to do the same, Lee asked his employees for constant innovation. "Research and development center[s] should work around the clock, non-stop," said the chairman. That could bring us a Tizen-equipped smartphone sooner than ever, or at least the Samsung Galaxy S5 and Galaxy Note 4 launches a little more quickly. Looks like the Samsung Galaxy Note 3 Lite will downgrade to a 720p display.